OMG Posters! » Archive "Missed Connection" Art Print by Adrian Tomine - OMG Posters! 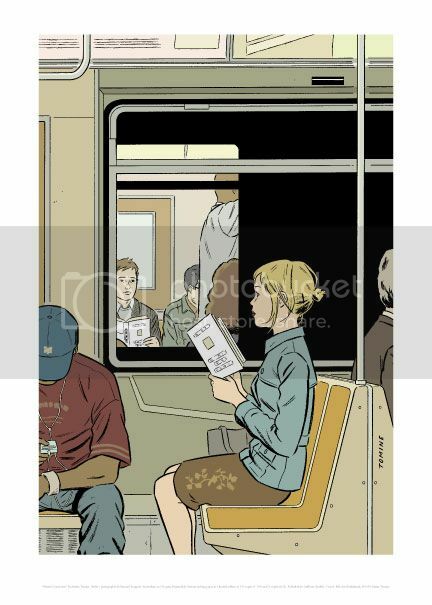 Adrian Tomine is offering up his first illustration for The New Yorker as an art print. “Missed Connection” is a large 20″ x 28″ giclee, has an edition of 150, and is $175. To purchase, shoot Griffioen Grafiek an email. Like this, but damn that price seems high. I want it, too, but I think that seems like it’d be about right price-wise. Adrian Tomine sells most of his stuff for a little bit more, I think. Adrian! Why Giclee? That totally could’ve been screenprinted for less. Huge Tomine fan, I own all his books but $175 for a computer print in ed. of 175? Blah. Thats about what I paid for my D.Danger print a while back….and thats the size of my bed. And speaking of Tomine, he needs some new comics. His last book “Shortcomings” came out ages ago…. Ah, to be famous, young and create one new work a year ….how I want it…! Huge Tomine fan, and I remember really loving this as a New Yorker cover. I was so excited to see it offered as a print, but $175 for a giclee edition seems pretty steep.